Leadership matters. Whilst there are many ways of grappling with leadership, I value the ontological lens and in particular the ontological model of leadership that has been developed and is being taught by Werner Erhard et al. In this post I continue the conversation on being a leader (and leadership) that I started in the last post. Today, I wish to grapple with authenticity. To grapple with and get authenticity one needs to grapple with human existence (being and doing). And in particular one needs to suspend one’s existing listening (how one thinks of, relates to) of authenticity. Furthermore, it takes courage as the conversation of authenticity/inauthenticity unconceals that which we are committed to keeping hidden. If you are not up for this today then I suggest that you go and do something else. If you are up for the conversation then let’s begin. 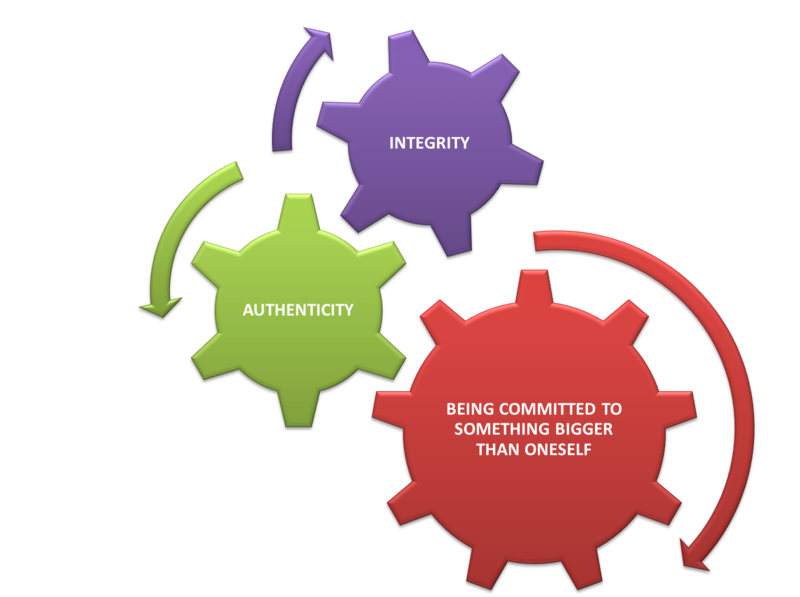 What constitutes authenticity in this ontological model of leadership? At a superficial level being authentic is being genuine, being real -“the real thing”. Dive into this, grapple with this, and you are likely to find yourself grappling with the question “How does a human being determine when he/she is being genuine, being real?” Put differently, “Genuine/real with regards to what exactly?” Think of it this way, determining whether this iPad before me is a genuine Apple iPad is a different realm of enquiry to determining if I/you are being genuine/real/authentic in the way that I/you show up in the world. Yet we need to ring-fence it if we are to grapple with it. “being and acting consistent with who you hold yourself out to be for others, and who you hold yourself out to be for yourself”. Notice that central to this definition is ‘who you hold yourself out to be’: not your personality, not your thoughts, not your feelings, not social convention…… How to make sense of ‘who you hold yourself to be’? Think of it as a declaration that you make, a stand that you take on yourself, a commitment to a set of values and/or specific future. Did you get that? The access to authenticity is being authentic (confronting the truth) about where/how you are being inauthentic (not being/acting in accordance with ‘who you hold yourself out to be’). Yet, almost no one does this. Do your remember how the business world reacted to Domino’s Pizza decision to come out in 2010 and tell the truth about their pizzas? Surprise, bafflement, astonishment: What, you are going to own up to the fact that your pizzas taste like cardboard! Inauthenticity is the default setting and state of human existence. You, I and just about everyone is being inauthentic – at the very least in some ways, at certain times, with certain people and in certain situations. To date I have distinguished two kinds of inauthenticity. First, there is the kind where I, you, sacrifice our personality, character, spirit, stand in response to external pressures: the pressure to appear to be a certain kind of person, the pressure to adopt a particular mode of living, the pressure to ignore one’s own moral and aesthetic objections in order to have a more comfortable existence. If you take the time to reflect and are willing to be open to that which shows up then you will see where and how often you have trodden this path. Else read Sartre’s novels – they provide a great access to the inauthentic mode of being/living. The second kind of inauthenticity is of the kind which is normally hidden from us. This kind of inauthenticity lies in the realm of what we don’t know that we don’t know: we do not have access to our real reasons for being the way that we are being, acting the way that we are acting, and we ignore crucial facts about own lives (and the world we find ourselves in) in order to avoid facing up to and confronting uncomfortable truths. Spend some time in the counselling room and you will see this vividly: you cannot help seeing how the human being is blind to certain aspects of him/herself. Or just watch the TV series “The Office”. Imagine that you are driving a car and you find that you have a flat tyre. Having a flat tyre is not an issue provided you are willing to acknowledge and confront the fact that you are driving a car with a flat tyre. Acknowledging and confronting the fact creates an opening for you to take effective action: to replace or repair the flat tyre. It is the same with inauthenticity: inauthenticity is not an issue if you and I are willing to confront where/how we are being inauthentic. Tell the truth (to yourself and the appropriate people) about where you are not being genuine, real, authentic – the appropriate people tend to be the one’s that you are most likely to resist telling the truth to. Most of us are driven to look good and avoid looking bad. Werner Erhard et al put it this way “.. most of us have a pathetic need for looking good, and almost none of us is willing to confront just how much we care about looking good..” Look, how many of us are afraid to ask a question or voice our opinion for the fear of looking stupid, the only one who does not get it? I say the reason so many of us insist on being right (rather than admit we are/were wrong) is to look good and avoid looking bad. Where are you sacrificing your authenticity simply to look good and avoid looking bad? If you do the work you will find a gold mine of inauthenticity here; it would not be going to far to say that wanting to look good and avoid looking bad runs us! Every single one of us wants to be admired (to be recognised as a person of worth/significance/importance/high status), and yet almost none of us is willing to be with and confront how desperately we want to be admired. And how readily we will give up our authentic voice, our stand, in a situation where we perceive that being straightforward, honest, genuine threatens us with a loss of admiration. In many situations, many of us want to be seen as being loyal members of the group even when we are not. How many of us are playing at being loyal simply to avoid the consequences (loss of admiration, looking bad, being made out to be wrong, being punished) of being perceived as being not loyal, not a team player. Have you noticed how easily you will sacrifice ‘who you hold yourself out to be’ for the sake of fitting in, being admired and rewarded? This is how you get ‘groupthink’ and the ‘Bay of Pigs’ fiasco and many others like it in organisations. If you wish to get a taste of authenticity/inauthenticity (and its importance to the human condition) then I recommend reading Book VI:The Russian Monk, Chapter 1:The Elder Zosima and His Visitors, Section (d) The Mysterious Stranger, from Fydor Dostoevsky’s masterpiece: The Brothers Karamazov. If you have the hardback edition by Pevear and Volokhonsky then the page number is 301. In the next post in this series I will take a look at the third foundational strand of the ontological leadership model: being committed to something bigger than oneself. For those of you who have made it this far, I thank you for putting into this conversation that which it takes to be in this conversation. I am grateful that you exist and that I have the privilege of being in this conversation with you. I look forward to listening to your perspective, your experience on authenticity.